Where Can I Buy Top Soil in Southampton? Home > Where Can I Buy Top Soil in Southampton? Do you fancy yourself as having a bit of a green thumb? If you do, then you are no doubt asking yourself, where can I buy top soil in Southampton? The answer is Abbey Turf. Our company will provide you with a high-quality product guaranteed to please even the most avid gardener. At Abbey Turf, we recognise the care and attention many of our customers display when tending to their gardens. The payoff can be incredibly rewarding with a result that will improve the appearance of your property tenfold. Our Southampton top soil company supplies products that will create a fertile environment in which to grow stunning flower beds. Top soil comprises the uppermost layers and is simply buzzing with microorganisms and biomatter. This creates the perfect ecosystem that is easy to till and great to grow plants in. At Abbey Turf, our top soil in Southampton is the ideal substitute for environments with poor soil quality. We package our deliveries in convenient maxi bags that allow for ease of use, and we can take care of all the heavy lifting for you. Whatever you require the soil for, we can help with a range of graded soil types to suit all budgets. For instance, premium quality is perfect for flower beds and nurseries due to its high fertility factor. A general-purpose grade is a go-to choice for lawns as well as creating the foundation for borders. Finally, an economy grade is the best solution for where quantity is preferred over quality. With some 25 years worth of experience under our belts, our family-run company knows a thing or two when it comes to top soil. When you are thinking to yourself, where can I buy top soil in Southampton? Just remember, not all top soil is the same. Depending on the source, the quality can often vary; ours, however, is of a consistently high standard. All of our top soil is rigorously checked for stone content, roots, weeds and other man-made contaminants. We grow our turf products across a 180-acre site using only the very best soils available. 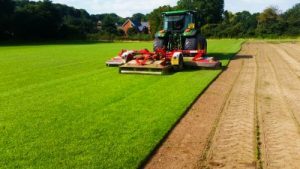 It’s this same product that we use to grow our turf which we supply to our customers including local authorities and privately owned clubs. So for the finest Southampton top soil that meets British standards 3882:2007 you should definitely pay us a visit. Where can I buy top soil in Southampton? Simple, contact Abbey Turf today on 02380 812302 or email us at info@abbeyturf.co.uk to find out more information.